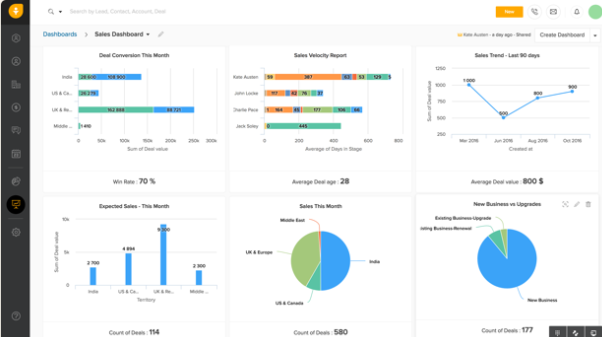 A sales dashboard is a visual display of sales performance and business data. It combines a series of reports and shows key indicators like monthly revenue, team member performance, opportunity-to-close ratios, and more. Sales managers, business owners, and salespeople can all use sales dashboards to track business health and measure sales goals. Some customer relationship management (CRM) software includes customized reporting features that create sales dashboards and can help you better manage your business. Freshsales, our top pick for best sales management software, is a CRM that lets you create a dashboard with up to six reports to access data and make decisions quickly. You can try Freshsales for yourself with a free trial. Sales dashboards work by consolidating sales metrics, also known as key performance indicators (KPIs), from several different reports into one easy-to-read screen. Dashboards can be created by combining data from multiple sources into a basic program like an Excel spreadsheet by hand. However, most CRM software does this automatically in real-time and can be accessed by a variety of users. Dashboard reports can be used in a number of ways. For example, dashboards can help sales representatives measure their progress toward goals as well as help them plan their sales follow-up activities. Sales managers can assess how their team is doing while also allowing for individuals performance comparisons. Business owners can use them to measure the health of their business or identify what aspect of their business needs additional focus. 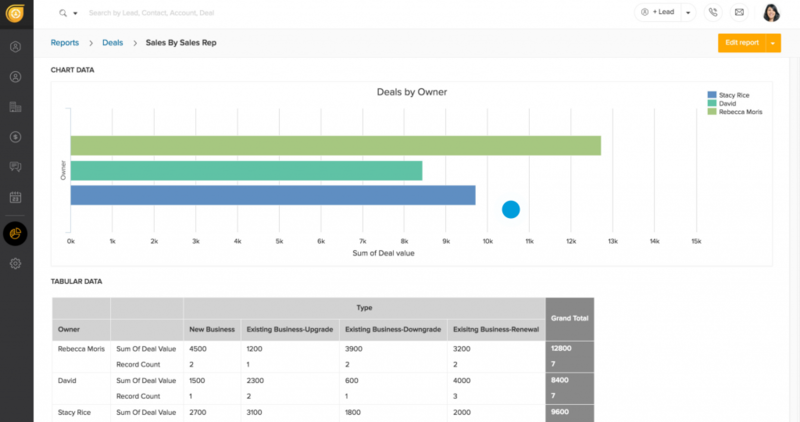 Many CRM programs come with standard dashboards. However, these can often contain more information than you’ll need as a small business owner. Customizable dashboards allow you to pick and choose what data you wish to see, giving you the ability to focus on the metrics that matter most to your business model. Example of a Freshsales CRM sales dashboard. Revenue by sales representative as reported in Freshsales. One of the most common sales metrics that both managers and employees like to check is how much have I sold this month? For managers, it’s also the simplest performance indicator. An employee with high sales is likely doing well, whereas one with low sales may not be doing so well. However, it’s not always the case since, for example, low revenue could be due to a number of deals not closing until the following month. Nonetheless, this report offers a first glimpse into how salespeople are performing. For salespeople, it’s a way to check their progress against quotas, company average, or even against other salespeople if your team has leaderboards. Revenue reports can also be displayed for teams or your company as a whole. This allows you to find broader trends in how your sales have improved or declined over time. Win/loss rate by month, as reported in Freshsales CRM. The win/loss rate, also known as conversion rate, is a widely used sales metric. Reports based on these metrics offer more insight than revenue totals because they tell you why the revenue has gone up or down. For instance, your monthly revenue report can tell you if revenue increased 10%, but not necessarily why. An increase in revenue could be due to advertising, higher markups on products, increased upsells, and so on. These reports can help you zero in on activities that support more wins and avoid more losses. Like most reports, win/loss rate can be generated for your company as a whole or individual sales team members with a tool like Freshsales CRM. Freshsales reporting allows you to drill down and see the win/loss ratios for specific employees and the reasons most deals are lost. This information can help you take corrective action and establish best practices. Loss rate by sales phase, as reported in Freshsales. Loss rate by sales phase identifies any potential weak spots in your sales cycle by tallying up when deals are lost. By pinpointing exactly when deals are getting lost in your process, you are better able to create a more specific strategy for improving your sales efforts at a specific point in time rather than waste time and effort by overhauling an otherwise effective process. For example, if your company is losing a lot of deals after the sales presentation, you can reexamine your sales pitch and take steps to improve it. 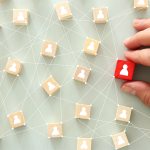 With many CRM systems, including Freshsales, this report can also be run by employees so that you can identify areas of weaknesses for individuals as well as the team as a whole. 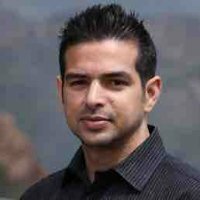 For Rahul Alim at Custom Creatives, the key stage to track besides deals won is “qualified presentations given.” Although his business has a full sales cycle with rounds of calls and emails happening beforehand, he focuses on this crucial stage first. Average sales cycle length in Freshsales. Also known as the closing speed, the average sales cycle is one of the simplest sales metrics, and one of the most essential. Understanding how long a sale takes on average helps you better estimate when certain activities like sending a quote should take place, allowing you to identify potential bottlenecks better in your sales cycle. Average sales cycle length will also help you make important decisions when it comes to managing your pipeline. For example, it can be used to determine when opportunities are growing cold. If a deal is lagging beyond the average length, you can trigger a warning and start pursuing additional efforts like price discounts. Your average sales cycle length can also be used as a baseline for individual sales team members. If a salesperson tends to take longer than average, you can help them identify areas of improvement. Conversely, if an employee is closing deals in a snap, you can find out what’s working for them and roll out their strategy to the rest of the team. Email activity report in Freshsales. Phone activity report in Freshsales. 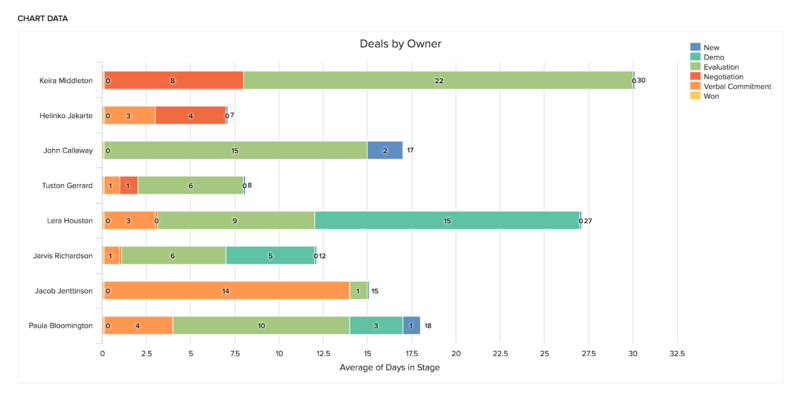 Sales activity reports quickly highlight the number of specific activities each sales rep is engaged in. You can use it to understand better where your people are spending their time and also use these types of reports to help identify ways an individual sales representative might improve their performance or prioritize their work better. For example, you can tell how many calls your team has made and how many emails they’ve sent on a given day. By comparing this number against either a benchmark or a high performer, you might find that an individual requires additional training, or you might find that they are spending too much of their time on deals where there is a low chance of winning. For businesses who rely on inbound leads, initial response time can be one of the most important sales metrics. In fact, you’re 100 times more likely to make contact with a web lead if you call within five minutes vs. 30 minutes, according to a study from InsideSales. In complex business-to-business (B2B) sales, there can be hundreds of critical tasks that need to be complete to move opportunities through pipelines. Consequently, it’s important for sales managers to keep tabs on the number of activities their sales reps are opening and completing as well as how quickly tasks are being completed. Opening and/or completing too few tasks can be a sign of bottlenecks in the sales process or a sign of not enough leads or prospects in the pipeline. From real estate to software to event planning, catching a lead at the moment they’ve discovered your website or having a mechanism in place to identify aging quote requests can make all the difference. Thus, tracking this time gap is a vital sales metric for many businesses. It can help you monitor and improve the speed at which your team is responding to leads and task requests. As a salesperson, it’s important to know the average value of a deal. This tells you how much money and effort are worth investing to try and win the average customer. The trouble is, this metric is only a small part of the picture. You also have to factor in future purchases that customer might make. The total lifetime value tells how much of your time is worth spending on new customers, also known as acquisition costs, among other insights. You can calculate just about all of these metrics using Freshsales CRM’s built-in dashboards functionality. Because Freshsales manages your accounts, leads, and opportunities, it can generate up-to-date reports on your dashboard automatically. Additionally, because Freshsales is customizable, you can decide which reports go onto your dashboard and what order they appear. Example of the six reports available on the Freshsales dashboard. In addition, you can create more reports by exporting data out of Freshsales CRM and into a comma-separated values file. Exporting data with Freshsales is simple. It offers step-by-step instructions on its support pages but are also happy to assist with this step. Freshsales offers a variety of customizable dashboard reports to help you and your team stay focused on what’s important. The best thing is you can try them out for yourself with a free trial. To learn more about how sales metrics and dashboards work with Freshsales CRM, sign-up here for a free 30-day trial. 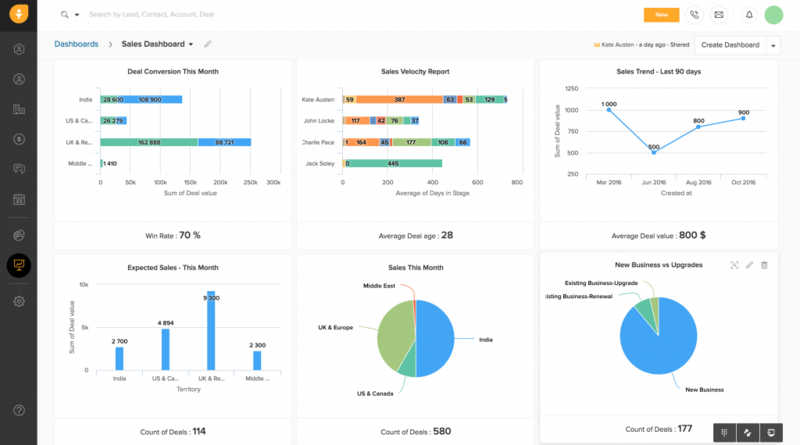 Sales dashboards are a large component of analytical CRM software. While some CRMs focus on sales and others on customer service, analytical CRMs focus on housing, presenting, and inculcating a data-driven culture to help sales professionals and business owners quickly visualize the current state or direction of their business. For more information on analytical CRM and the CRM types, see our article, Types of CRM: What They Are and Where to Find Them. There are countless sales metrics or KPIs that sales managers can use to manage sales and performance. The ones you choose depend on factors critical to generating revenue for your business. A common sentiment among small business owners is that they don’t have time to review every report they’d like. Therefore, mastering a few key metrics like the ones in this article offers a wide-ranging overview of their sales activities. Freshsales offers several customizable dashboard-style reports designed for showing critical sales metrics and common performance indicators at a glance. These reports help improve performance and while making sales management easy. To create your own sales dashboard using Freshsales CRM, sign-up here for a free 30-day trial.